Welcome to Meeting Management System. Meetings are vital for management and communication. Properly run meetings save time, increase motivation, productivity, and solve problems. Meetings create new ideas and initiatives. Meetings diffuse conflict in a way that emails and memos cannot. 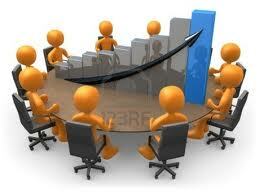 Meetings are effective because the written word only carries 7% of the true meaning and feeling. Meetings are better than telephone conferences because only 38% of the meaning and feeling is carried in the way that things are said. The other 55% of the meaning and feeling is carried in facial expression and non-verbal signals.